New Digital Release - 40th Anniversary Celebration ENCORES! | Delos Music | Outstanding Classical Recordings for over 40 Years! New Digital Release – 40th Anniversary Celebration Encores! In April 2013, Delos released the 40th Anniversary Collection — 40 Tracks for 40 Years, a 3-CD set of carefully chosen selections from our extensive, 500-plus catalog of prime recordings by legendary artists, captured in our hallmark audiophile sound. From all the wonderful candidates that overflowed the confines of a 40-track collection we have chosen an additional 13 as Encore Tracks. This new release offers, for your listening enjoyment, thirteen memorable and beautifully performed tracks divided among all three categories that will happily expand upon your 40-for-40 listening experience, and give you an even better overall impression of Delos’ refreshing diversity, matchless artistic excellence and legendary sound engineering. We didn’t have room on the CDs for everything we picked – so we were left with some very hard choices – plus quite a few tracks of exceptional merit that narrowly missed the cut. … but now you can hear them, too, as Encore Tracks. Thankfully, we live – music-wise – in the age of the digital download, and can thus offer you a digital version (on iTunes and other online vendors) of the complete 3-CD set. That release’s digital booklet groups each CD’s content according to three major program themes: the “Splendor” of orchestral music, the “Passion” of vocal music, and the “Brilliance” of solo instrumental or chamber music. 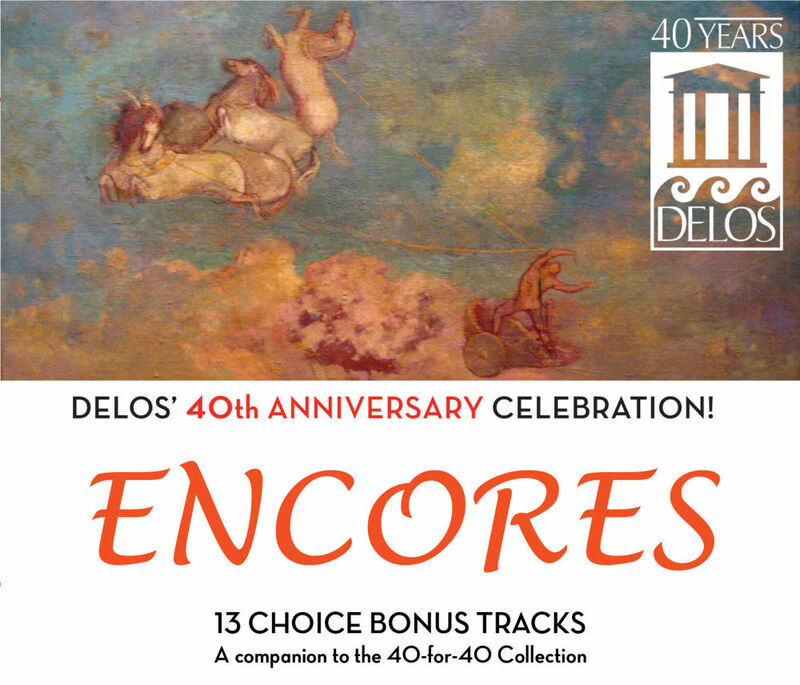 The ENCORES program offers 13 tracks overflowing the confines of our 40-for-40 Collection. The perfect addition to your library as a companion feature to your original 40-for-40 release, whether it’s in physical or digital format.